between a customer choosing to keep your card, or simply throwing it away. Consider paying a graphic designer to spend a couple of hours generating a creative design and finding an attractive font that reflects your business’s identity. budget – is online business software that enables you to create smart business cards without paying for the services of a graphic designer. the software allows businesses to upload their logo, add contact details and other copy, and layout their cards ready for printing. Include your business name, address, telephone number, email address and web address. If your company uses LinkedIn, Twitter or other social media, include that information too. Personalized cards for each member of staff may be better than generic cards and should include the individual’s name, job title and direct contact information. Typos and grammatical errors reflect badly on your business. Recent studies suggest that they can erode potential customers’ trust in your business. 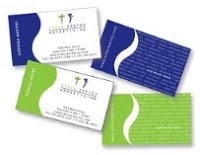 Spell check your business cards thoroughly and make sure the copy is grammatically correct. Ask someone who has an excellent grasp of spelling and grammar to re-check it for you – or even pay a proofreader. Business card copy should be as concise as possible. Avoid squeezing in too much information or using a font that is so small it’s unreadable. Alongside core contact information, aim for a one-line explanation of what your business does, or use your company’s strapline if you have one. A short, punchy strap line summaries what you do and helps customers remember you. Avoid complex language or industry jargon, and make it easy to remember. The phrase should emphasise your business’s unique selling points, perhaps incorporating the problems you can solve, or who can benefit from your service. A company logo is the obvious choice of image to include, reinforcing your brand identity and fitting in with company signage, brochures or web design. Some freelancers and companies also include a portrait photo to personalize cards and help people remember an individual’s face. Finally, it’s time to source good quality card and a reliable printer. Augment your design by looking at interesting card stock, lamination, or even embossing or varnishing. While you may be able to afford a larger quantity of cards by opting for flimsy paper stock or a cheaper finish, it’s better to go for good quality that makes your business stand out and reflects the quality of the service or product you offer. When Louisa Logan launched her company, she chose to design her own business cards using business software found on soft32.com. They worked well and her business is still turning profitable revenue three years later.